When the average Christian thinks of Judaism, they think of the Jewish people of the nation of Israel that are written about in the Old Testament of the Bible. That is why there is so much talk about Judeo-Christianity in America. Christians have taken the fact that God worked through His chosen people, the nation of Israel throughout the Old Testament and then they link that with how God then reached out to Gentiles in the New Testament. They feel it gives them a solid foundation on how to look at their Christianity to call themselves Judeo-Christian, but I think we need to explore a lot of things from the Old Testament nation of Israel to what is now modern day Judaism, because there is a lot of misunderstanding. The first and most crucial point I can make is: the people of the nation of Israel who lived during the Old Testament times were known as Hebrews, not Jews, and they knew God from the law that came from Moses, which is written about in the Torah, (the first five books of the Bible - Genesis, Exodus, Leviticus, Numbers and Deuteronomy). But modern day Judaism for the most part is not based on the Torah at all. There are some modern day Jews who have their religion based solely on the Torah, but really there is a very small number of them, because the mainstream form of Judaism since the 6th century AD is Rabbinism or Rabbinic Judaism. 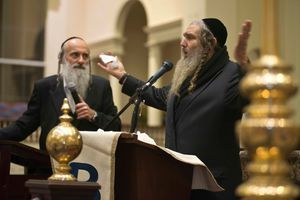 The Rabbinic Jews, seen here in the picture to the left, are centered on the Babylonian Talmud, which were laws that were written under Babylonian influence from when the Jews were in exile there. You might remember Jesus spent much of his time scolding the Pharisees and that is because they taught these extra laws to the Jewish people and they were man-made and not of God. The complete Talmud collection of laws were not completed until after Jesus' death so there are some writings of Jesus in them. But, if you can keep an open-mind and review everything presented here, the video directly below that shows Zionism is deceitful and then the videos of Jewish people who have accepted Jesus at the bottom of the page, (which then makes them chosen people of God, because they are in Christ), and then the End Time Eschatology page I wrote, I feel you will actually be more of a friend to the Jewish people than if you stayed in the disinformation that Jews today are still favored by God more than all other peoples of the world. But more importantly, your foundation will be fully Christ and you will be safe when the storms of deceit rage against you in these end days. So with all of that preface said, please view the below video - you will learn a lot and be liberated! Do you see where God says, "if" they obey his voice and keep his covenant" they would be his peculiar treasure above all people? Well, throughout the Old Testament the Jewish people got punished by God for their unfaithfulness to Him but God continued on giving them chances to get right. God sent prophets who foretold of their Messiah and described Jesus perfectly but still they did not obey God and keep His covenant when Jesus invited them to love him and believe in him. So they ceased to be His peculiar treasure and now God sees believers in Jesus as His peculiar treasure. There is no way to be pleasing to God without faith in Jesus, so the Jewish people need to accept Jesus if they want to be God's peculiar treasure. Malachi 3:6 - For I [am] the LORD, I change not; therefore ye sons of Jacob are not consumed. This verse, a New Testament verse, is the words Jesus said to the Samaritan woman who wanted to know who was right, the Samaritans (who the Jews hated) or the Jews in knowing God. Now this verse may sound like the Jews are all saved but what it is actually saying is that all the prophets spoke of the Savior as one that should come out of the Jewish nation, and that through him the knowledge of the true God, and of the true way of worshipping and serving him, would be communicated to the rest of mankind. This verse, a New Testament verse, (as are the rest that will follow), is referencing the Old Testament prophet Isaiah who said that only a remnant of the Jewish people would be saved. Isaiah is the main prophet who identified Jesus Christ in descriptive words so the Israelites could identify Him. Because of God's faithfulness to the descendants of Abraham, Jesus came first to the Jews but when they mostly rejected Him, God offered the Gospel to the Gentiles. Romans 10:12-14 - For there is no difference between the Jew and the Greek: for the same Lord over all is rich unto all that call upon him. This verse tells us that when people believe in Jesus, there is no distinction from one nationality to another, there is no difference in God's eyes, we all become new creations in Christ Jesus. This verse tells us that once Jesus came and there was the new covenant between man and God in Christ Jesus, that nothing outwardly counted. So, a Jew was no longer someone who had the Jewish lineage or the Jewish ceremony of circumcision or anything else that was outwardly. Because of the new covenant in Jesus, a Jew is now defined as those who are believers in Christ Jesus. This verse is similar to the one above in Romans 10:12-14 except it goes on further to explain that all believers in Christ are free from old distinctions. Revelation 2:9 - I know thy works, and tribulation, and poverty, (but thou art rich) and [I know] the blasphemy of them which say they are Jews, and are not, but [are] the synagogue of Satan. This verse is about how Christians were being persecuted by Jews and God told them that these Jews, (who felt they had the right to destroy the Christians because of their "high-standing" with God) were not of God, but of Satan. And the verse below is similar but goes on to say the Jews who hold to the synagogue (rather than become disciples of Jesus) are liars and are of Satan and they will someday be made to worship at the feet of the persecuted Christian. God was assuring the Christians that if they could endure under the cruelty of these persecuting Jews, there would be a day when the Jews would know that Christians were the ones that God loved. Below are some testimonies of Jews that are God's chosen people because they have accepted Jesus Christ as their Savior! Each tells their journey out from lost-ness as a "faithful Jew" into the saving grace of Jesus Christ! Praise the Lord!